Avalanche Studio reveals a mysterious "steampunk-style" open world game....which is on hold. Earlier this year, Just Cause 2 devs Avalanche Studios sent out a tweet containing a few blurry images. 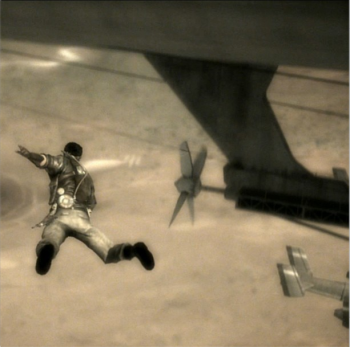 As much as it looks like Rico leaping out of an aircraft, it is not a Just Cause 3 screenshot. In a massive tease, Avalanche CEO Christofer Sundberg revealed in an interview with Edge that it's not a sequel, but an unannounced "steampunk-style" game that has since been put on hold. In the interview, Sundberg talks about Avalanche's strategy for the future and their next-gen plans. Partway through, the interviewer confronts Sundberg on his mysterious tweets from a few months ago. Sundberg responds: "They were from a steampunk-style game we had in development that we put on ice. I really love that art style, and to combine it with sandbox gameplay is a dream of mine. Fortunately, being an independent developer I can control my own destiny and we'll make something in that world sooner or later." So, good news and bad news there. The CEO wants it to happen, but it's not on the table at the moment. Perhaps after they clear the room of all the Star Wars and Mad Max rumors, we'll see a grand open-world action title featuring airships and pneumatic-powered grappling hooks. As far as current projects go, Sundberg says that "the earliest we'll be able to talk about it and go into any detail is after the games we are working on are announced", which makes a certain kind of logical sense. Meanwhile, If you've (somehow) hit 100% on Just Cause 2 and are anxiously awaiting their next game, there's always multiplayer madness to test out.